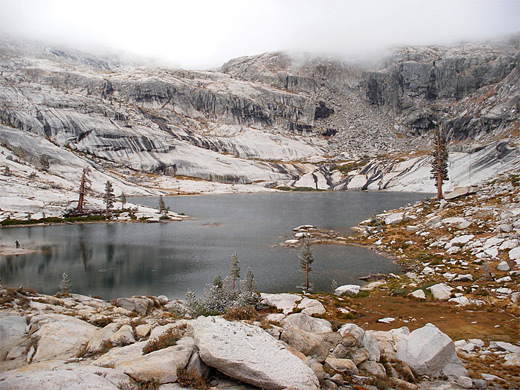 Because of the dramatic and varied surroundings, the Lakes Trail provides the best day hike into the high Sierra backcountry of Sequoia National Park. The 5.8 mile route passes through thick forest and along the rim of a deep canyon, then leads to four glacial lakes in the middle of a stark granite landscape, equal in beauty to anything in Yosemite National Park, which is generally better known for mountainous scenery than Sequoia. The path gains 2,270 feet in elevation, mostly over the first few miles, but the route is relatively easy and the round trip quite possible in about 6 hours. The path begins by a large car park at the Wolverton ski/picnic area, reached by a 1.5 mile side road from the Generals Highway. It enters the forest, turns right at a junction after 150 yards then begins a long steady climb up a wide ridge. On the north side the land falls away steeply, 800 feet down to the valley of the Marble Fork of the Kaweah River, site of the Lodgepole visitor center, though this canyon is mostly hidden by trees. The south side of the ridge slopes to a much shallower valley, with a small stream running through (Wolverton Creek), and patches of marshy meadowland. The forest is quite open, filled by pine trees of all sizes, many partly covered by moss and some surrounded by clusters of ferns - the woods seem to receive quite a lot of rainfall. The path curves a little to the south, crosses a few granite outcrops and a small creek, then reaches a junction (1.7 miles from the start); the right branch leads to Panther Gap after 0.9 miles then continues to many places further east, including Alta Peak, Alta Meadow and a junction with the High Sierra Trail. The left fork (to the lakes) climbs another 250 feet and re-crosses the small stream, now flowing through a thin green corridor of grass and ferns between tall pines at either side. The path splits just beyond, both branches rejoining further on, and although the right part of the loop - the Hump - is 0.2 miles shorter, the left half (the Watchtower route) has less elevation gain and better views, so is normally preferred. It is nearly level for a while but soon begins a continuous ascent, gaining nearly 1,000 feet while passing several viewpoints right on the edge of sheer cliffs high above the upper end of Tokopah Valley and the Kaweah River. The trail cuts across vertical cliffs for a way, with a long drop to one side. After a small descent to a flattish area, and the junction with the other branch of the trail, Heather Lake comes into view. This has a secluded location in a bowl-shaped chamber at the foot of steep, streaked, granite cliffs, enclosed by trees and jagged boulders, and comes as a pleasant surprise after the preceding miles of mostly gloomy forest. The path continues up and over a ridge, where the trees fade away, replaced by miles of pure granite wilderness. 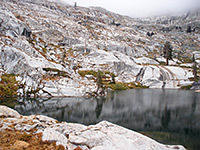 The smaller Aster Lake sits 200 feet below, partly hidden behind a thin belt of woodland, while lake number three (Emerald) is just ahead, a short distance off trail. This is similar to Heather except for the lack of trees, and although its enclosing cliffs are not quite as steep, the lake is just as pretty. Walking onwards, the path turns to the north, rounds the end of a high, narrow ridge, and reaches a final junction with a short spur to the Pear Lake Ranger Station. 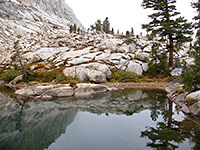 The final 0.6 miles to Pear Lake climbs a little, passing over a field of boulders to the edge of the water, at elevation 9,550 feet. Pear is the largest lake and has especially imposing cliffs on the far side, formed of pale grey granite and like many of the rocks hereabouts are streaked with vertical black bands left by the corrosive action of rainwater and melting snow. Dispersed camping is allowed at all lakes except Heather - several numbered sites are spread around each shore, together with bear-proof food lockers and even rest rooms, which detract a little from the wilderness feel. The lakes all contain crystal clear water that harbors a healthy population of fish. 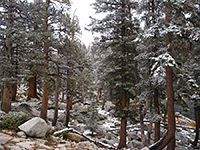 The path is snowbound and wintry for up to half the year, though blue skies prevail most of the time during summer. On this occasion, a combination of light snow, thick fog and just a few blue sky patches made the landscape especially mysterious and alluring.